We are in contact with other SS/AMX owners who plan to have a special display at the American Motors Owners National Show in Auburn, Indiana on July 18, 19 and 20, 2013. We would love for you to join us. The link for information on that show is http://amonational.com. It was in the early 1990s that the Rick and Paulette Riley first became aware of the 52 elite racing cars known as Super Stock AMXs created by the American Motors Corporation and Hurst Performance. It was decided to add one of these super rare vehicles to the Riley collection. The search for a SS/AMX continued until 1995 when SS/AMX #19 was sold from the Otis Chandler collection. After negotiations, Super Stock AMX #19 took up residence with the Rileys. Over the years, the AMX provided a great deal of pleasure even though its racing was limited to sprints up the country road where the Rileys live. It was a big hit at events from concourse shows to local cruise-ins. As the years went by, it was decided that this AMX was definitely "not for sale" at any price. In 2009 Hemmings Muscle Machines decided to do an article on SS/AMX #19. We gave them all the history we had been able to gather, and the author of the article tied everything together in a clear provenance. A person who knew Joel Sporn, son of the owner of Westbury Rambler where the AMX was sold new, brought the article to his attention. 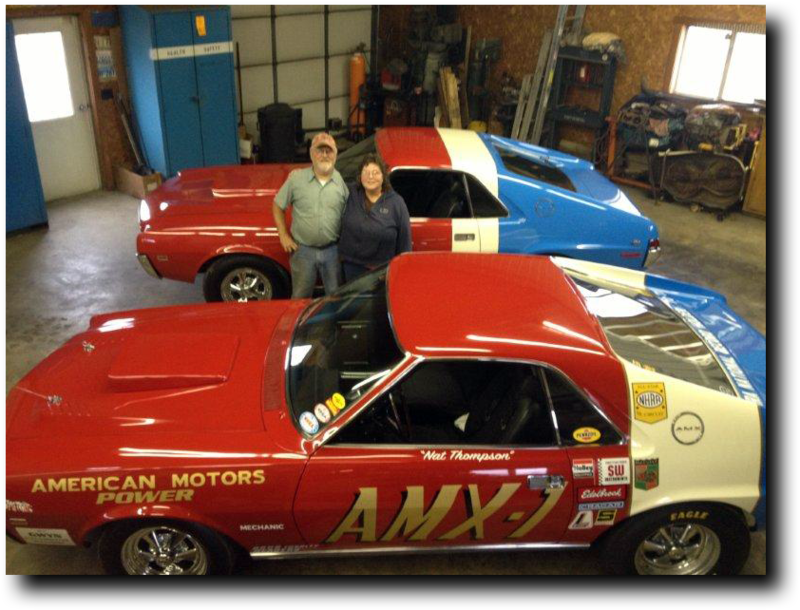 Joel and his siblings had watched AMX#19 race in 1969 and the early '70s. They all had fond memories connected with their father and mother and the good times they had associated with AMX#19. Joel made it his mission to return AMX #19 to his family. Rick Riley was contacted by Joel Sporn. Unfortunately, SS/AMX #19 was "not for sale." Promises were made that if the car ever did become available for sale, the Sporns would have first option to buy it. Several years passed, and in 2012 AMX-1 was put up for sale. (AMX-1 is the name the car was raced under in the day; it is actually #31 in the original production run of 52.) After much consideration, the Rileys decided that if the Sporns would be willing to purchase AMX-1, they would trade #19 for it. The Sporns would have their AMX back home; the Rileys could start a new adventure with AMX-1. So that brings us to the present. It's very rare in life when everyone gets exactly what they want. This seems to be one of these instances. Of course, none of this could have happened without Dave Lesick and his outstanding efforts in researching and restoring AMX-1. We plan to be good guardians of his legacy to the SS/AMX racing history. For more information check out Hemmings Daily. 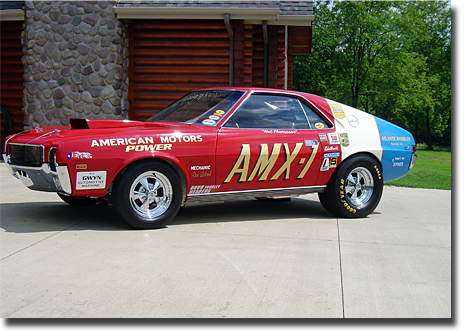 AMX-1 is a factory built, modified by Hurst, super stock race car. It is number 31 of 52 built. It was owned by Atlantic Rambler of Norfolk, Virginia and was driven by Nat Thompson and Donald Leland. It held the NHRA super stock class D and C national records and it also held the IHRA super stock class C world record. Here is a little information of how the super stock Amx came to be. After seeing the tremendous success of the hemi Darts in 1968, American Motors decided to have Hurst build a proto type super stock AMX. When the final product was tested and presented, they were extremely impressed and immediately signed a contract with Hurst to build 50 cars to compete in super stock. NHRA required 50 cars to be built to compete in super stock classes. Amc sent 52 – 53 cars to Hurst so if one was damaged in transit, etc., there would still be enough to comply with NHRA rules. The cars had sequential VIN numbers starting with X213560. All of the 1969 AMX’ were frost white, 390, 4 speed cars. All of the cars had charcoal interiors with the radio and heater assemblies deleted. The cars had stamped metal plates for the heater and plastic delete plates for the wiper controls and radio. There was also a stamped metal plate that sealed out the outside air (cowl vent) on the inside of the firewall. All of the cars came with AMC 20 rear ends with 4.44 gears, forged one piece axles and drum brakes on the front, a Lakewood blow proof bell housing, a steel flywheel, 2.64 T-10 with relocated Hurst super shifter with the heavy duty sweged tube shifter rods. The shifter was moved up and back towards the driver. The engines received J&E 12.5-1 forged pistons. The heads were modified by Crane, Edlebrock STR-11 cross ram with two Holley carbs, a sheet metal formed hood scoop, 4 hood pins, and Doug Thorley 1 7/8” headers. Hurst did not modify the oil pan and they also left the stock cam in the engine. One of the first things the drag racers did was change the cam and increase the depth of the oil pan. Some went a step further and either purchased or built their own drop out cross member. This made oil pan removal very easy. The rear wheel openings were opened up to allow 10” drag slicks, the maximum allowed for super stock. The rear front spring pockets were modified. The battery and mounting box was moved from the right front of the car to the right rear of the trunk. All of the carpet padding and sound deadener was removed as was the hood latch, support bars and sway bar. 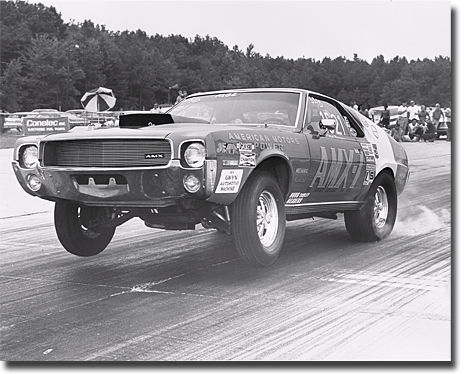 As you will see, AMX-1 is one of the finest examples of a factory built super stock race car intended for drag racing competition only, and was never titled or intended to be driven on the street. A special thanks to the late Tom Kennedy, founder of 4 Wheel Drive Hardware. If it was not for his vision and enthusiasm AMX-1 could have been lost to time. Fletcher (Fletch) Harrison for many vintage pictures and information on AMX-1. He is also responsible for introducing me to the next gentleman on the list. Bill Gwyn of Gwyn Automotive and Machine. Bill was responsible for building the engines that AMX-1 used to set the NHRA and the IHRA national records. When I first called Bill and told him who I was and what I was trying to do, the first thing he said was "young man, I am sitting in my office looking at a picture of AMX-1 with the wheels in the air". Unbelievable that he still had a picture of AMX-1 on his wall that was 40 years old. Bill was kind enough to send me all of the pictures and information he had on the car. And then he introduced me to the next gentleman (sadly Bill Gwyn has since passed away). Sam Vanderslice, owner of AMX-1 and Atlantic Rambler. Sam still had many pictures and articles for the car, which he sent me. A true gentleman and the man responsible for AMX-1 ' success. Sam also provided many pictures and records that Don Leland set when he drove the car. Rick Dailey for his help. Dave Lesick for all of the hard work you put into restoring the AMX-1 and allowing it possible for us to own this beautiful piece of racing history.